U Work 4 Utah • Two brothers, frustrated by unanswered phone calls and a chaotic town hall, try a new way to reach the congressman. Steve Griffin | The Salt Lake Tribune Billboard in Utah County on I-15 between Center Street and University Parkway in Provo Tuesday April 11, 2017. Chris Detrick | The Salt Lake Tribune U.S. Rep. Jason Chaffetz, R-Utah, speaks during the town-hall meeting in Brighton High School Thursday February 9, 2017. Steve Griffin | The Salt Lake Tribune Billboard in Utah County on I-15 between Center Street and University Parkway in Provo Tuesday April 11, 2017. 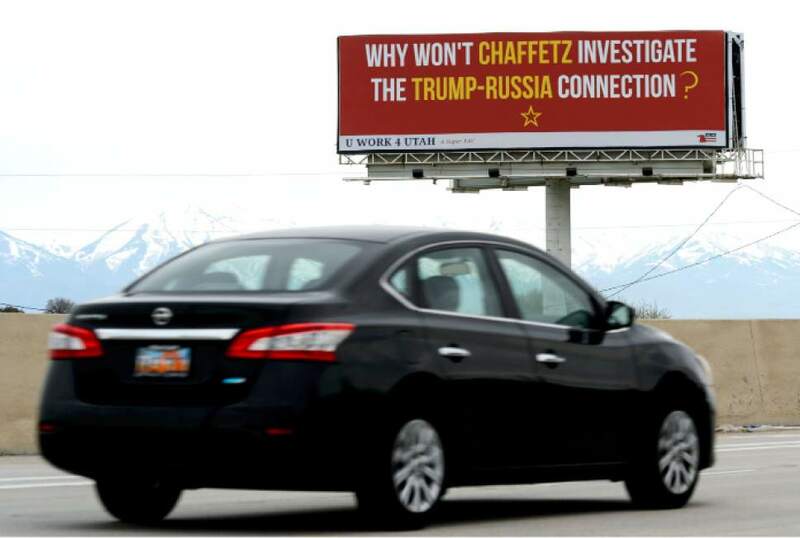 After several frustrated attempts to reach Republican Rep. Jason Chaffetz&apos;s office by phone and a failed bid to question him during his chaotic town hall, Jeremy Voros is trying another way to get his message across: a 48-foot-wide billboard alongside a busy stretch of freeway in Provo. "Why won&apos;t Chaffetz investigate the Trump-Russia connection?" reads the sign, which mimics the design of the former Soviet Union&apos;s flag with a star and gold sickle for the question mark. As drivers pass by on northbound Interstate 15, Utah&apos;s snow-capped mountains appear underneath the bright-red billboard. "The more traditional methods of getting our elected officials&apos; attention do not seem to be working," Voros said Tuesday afternoon, hours after the sign was installed. The idea to pressure Chaffetz with the hard-to-miss message grew out of a political action committee (PAC) that Voros formed in March with his brother Chris Voros. The two men  both registered Republicans in Salt Lake City  have raised nearly $12,000 for the U Work 4 Utah PAC. They put $2,700 toward the billboard that will remain up for 28 days. "It&apos;s just north of the exit that you would use to access Chaffetz&apos;s Utah headquarters," said Chris Voros, a 37-year-old consultant. "We&apos;re hoping that if by any chance he makes it back to Utah that he would at some point drive by it." 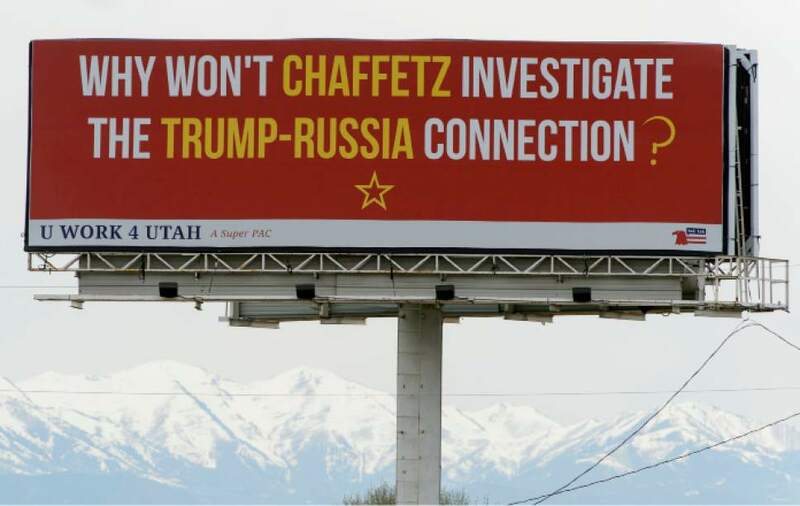 The billboard is the latest in a series of schemes from residents in Utah and in the District of Columbia increasingly upset by Chaffetz&apos;s leadership and recent comments, including a controversial remark that poorer Americans may need to forgo purchasing a new iPhone to afford health insurance and that the attendees at his February town hall were paid protesters. He later walked back both statements  but not before losing some of his sheen, it appears. 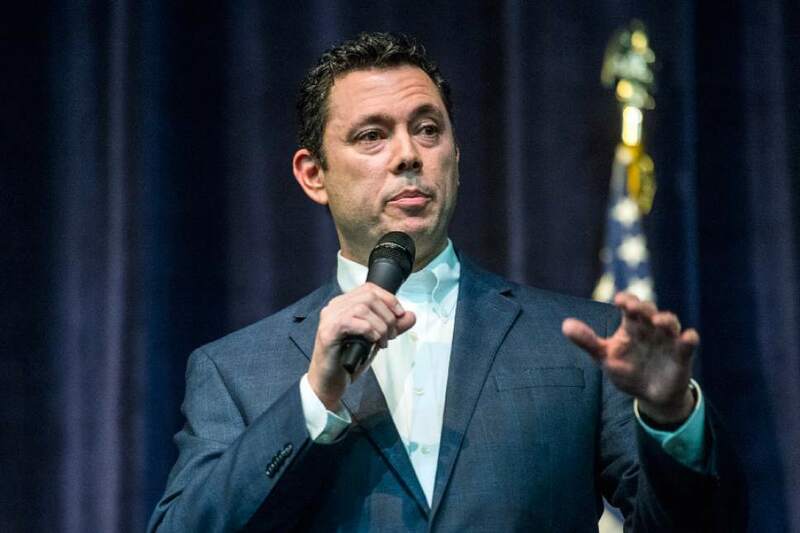 Fifty-two percent of 3rd Congressional District voters approve of Chaffetz&apos;s performance in office  far below previous ratings  according to a new Utah Policy poll. "I have not seen the full poll," the congressman and chairman of the House Oversight Committee responded Tuesday. "The most recent poll was the important one: It was the election. I won by the biggest margin in the state at this level, as I have for the past four elections in a row." In the 2016 race, Chaffetz won with 73.5 percent of the vote in his largely Republican district that stretches from Salt Lake County and through Provo to San Juan County. Since he was elected in 2008, the congressman has not dipped below 70 percent of the vote. The Utah Policy poll found that Chaffetz has much higher support from the right than the left, gaining favor from 76 percent of Republicans in his district and disapproval from 96 percent of Democrats and 56 percent of independent voters. Additionally, 49 percent of Utahns statewide view the congressman favorably. The survey among 844 registered Utah voters was conducted by Dan Jones & Associates March 22-29. It has a margin of error of 3.37 percentage points. Pollster Dan Jones said it is the lowest he&apos;s seen Chaffetz&apos;s approval during his nine years in office  and points to questions surrounding Russian meddling in the election of Republican President Donald Trump and reluctance of Congress to confront them, along with other controversies. While he hasn&apos;t doggedly investigated Trump&apos;s potential conflicts of interest as many residents have demanded, Chaffetz has backed an investigation by the embattled House Intelligence Committee to look into Russian interference in the 2016 election. The Voros brothers say a majority of constituents would like to see more from Chaffetz in leading an investigation. And they&apos;re not wrong. About 62 percent of state residents want Congress to probe U.S. intelligence findings about the Russian hacking, according to a Salt Lake Tribune-Hinckley Institute of Politics poll conducted in March. That&apos;s why, Chris Voros said, they paid for the billboard: to remind the congressman "that his constituents right here in Utah are still concerned about this issue." Chaffetz, though, didn&apos;t seem convinced that the signs were the best platform for the message. "They can keep wasting their money. It&apos;s up to them," he said. Still, Jeremy Voros, a 38-year-old physician, said the PAC will fund additional digital billboards targeting Chaffetz. Those signs are scheduled to appear in Utah County along I-15 later this week and cost about $4,700. "People are calling him on the phone and not getting a lot of feedback," Voros said. "A large number of people showed up to the town hall, and it didn&apos;t do a lot. This is an attempt to push that dialogue further."